Chalford Hill School, originally called The British School, was built in 1874. It stands on the top of the hill with views out to the surrounding hills and valleys. The school is built from Cotswold stone, which is the local building material. Gloucestershire County Council decided to replace two life-expired temporary classrooms at Chalford Hill Primary school with two new permanent classrooms. The temporary classrooms were not fit for purpose and did not offer a good learning environment. 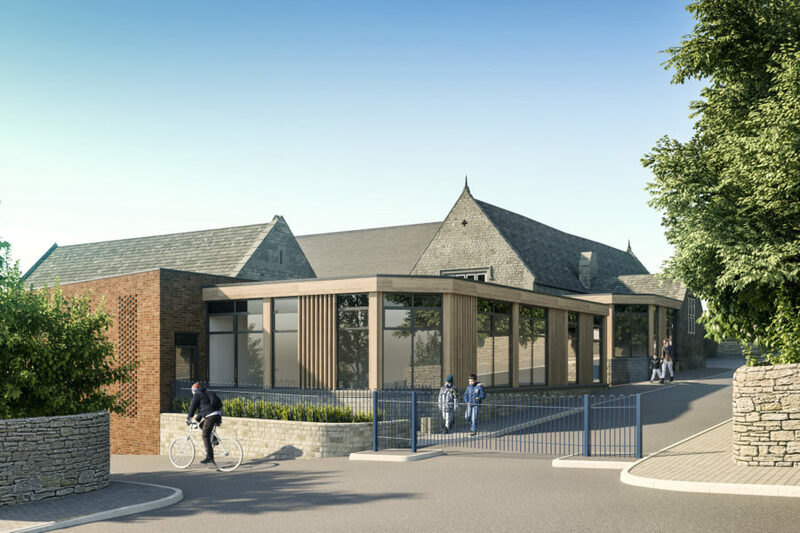 The concept for the external appearance of the building was to put forward a sleek, quiet building which sits low on the site in deference to the gables of the existing school building. A flat roof was proposed to give the building a contemporary feel and to ensure the building sits as low as possible allowing the gables to be retained and celebrated. Due to the restricted access and working in a live school environment, the project had its own challenges affecting the roof installation. 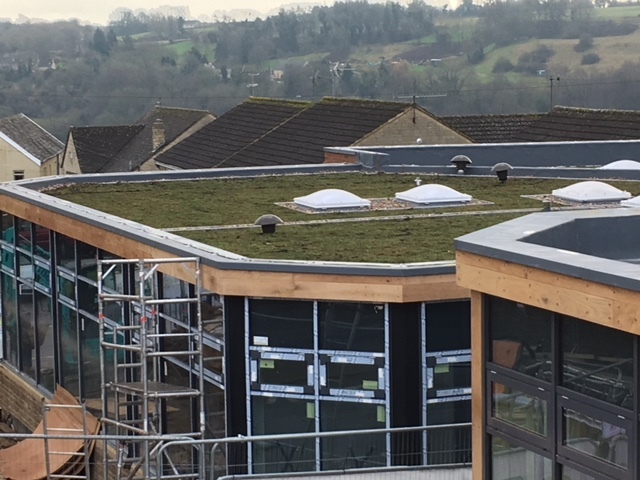 All materials incorporating the roof build up including the green roof components had to be man handled to the roof level by minimising the disruption to the school kids and staff. The roof had an unusual shape on the plan which required great attention to detail during single ply installation. This was due to various complicated interfaces with the existing building which was built to a traditional format (Circa 1950’s, stone and tiled roofs). The standard 1.2mm thick IKO Spectraplan membrane has excellent levels of flexibility and elasticity thanks to its very high polymer content. These characteristics enabled the roofing contractor Central Cladding to deliver a high quality installation in significantly less time. Spectraplan welding parameters are typically 200◦c to 600◦c and up to 6 linear meters per minute on long straight runs. As well as providing Central Cladding with faster installation rates, Spectraplan TPE membrane has also helped with the tricky details in this project as low welding temperatures gave the installers more time to achieve the complex details without overheating the membrane. The client’s brief was to develop an energy efficient building that meets the needs of the building users, is responsive to the external climate, and has minimal carbon footprint. The air tightness of the building impacts heavily on its energy consumption. The more air tight the building, the less energy is required to heat it in winter. Provided that the detailing at intersections with walls and penetrations is followed correctly, IKO Polymeric’s Spectraplan Single Ply Roofing System with a bonded IKO System S-A Underlay VCL provides the building with an air tightness at <5 m3/h/m2 @50Pa. This helped Spectraplan membrane to meet another important requirement of the project brief. A sedum roof was also specified as they offer a number of benefits including; Lower Carbon Footprint, Biodiversity and Water Management which fit perfectly with the project brief. Spectraplan was also the perfect solution to match with the environmental friendly features of the green roof, as the membrane is free from halogens such as chlorine and bromine. Softeners and (H)CFCs are also absent. 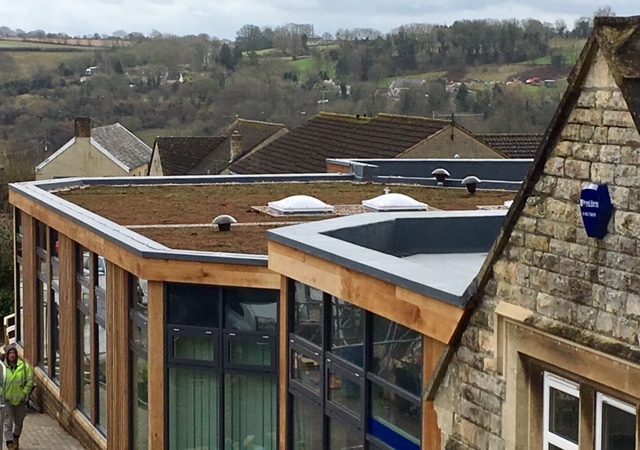 The new addition to Chalford Primary School was successfully completed by using efficient, environmental friendly, modern materials and design without detracting away from the traditional feel of the surrounding school buildings.